Wednesday (Faith in Pitino being tested) edition: Wha' Happened? All the close losses and ugly stretches have served to test the patience of the Gophers faithful, particularly when it comes to the second-year head coach. 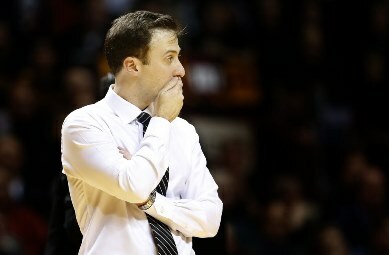 Richard Pitino was hired as Gophers men’s baskeball coach in April of 2013, a couple weeks after Tubby Smith was fired. Smith was jettisoned right after leading Minnesota to its first NCAA tournament victory since 1997 and its first non-vacated NCAA tourney win since 1990. The sentiment — which still seems like the proper one — is that Smith had taken the program as far as he was going to take it. There was a level of stagnation with the players and apathy in the Barn. Pitino was brought in, and the presumption was it would take some time for him to bring in players to fit his style — that the program might need to take a short-term step back in order to take a larger step forward in the long-term. Earlier this week, before that loss, Pitino suggested last year’s team had overachieved and re-asserted that he wasn’t the one who set expectations for this year’s team. On the first point: maybe so, though Pitino still had some nice leftover pieces (namely Andre and Austin Hollins) left over from Smith’s NCAA tourney team. This year’s problems are myriad. The Gophers have had eligibility issues, a transfer kicked off the team, a current player transfer and still another get in trouble with the law. The core of the team, though, has remained intact and reasonably healthy. If last year’s team overachieved, this year’s bunch has underachieved. All the close losses and ugly stretches have served to test the patience of the Gophers faithful, particularly when it comes to the second-year head coach. The grumbling starts with this: if the Gophers are 1-6 this year, what are they going to be like next year when they lose their two most established guards (Andre Hollins and DeAndre Mathieu) and their two most established big men (Mo Walker and Elliott Eliason) to graduation. The counter to that is those players have faltered in key situations this year and perhaps the next wave will be better. More likely, though, is that this rebuild won’t start to really take off until Year 4, when Pitino has a roster full of his players, and they have a measure of Big Ten experience. That’s a long time to be patient — fans and administration alike — and it will offer plenty of time to compare Pitino to his predecessor. Pitino’s Big Ten regular-season record stands at 9-16 (.360) as of now. Conference record was one of the biggest knocks on Tubby, who finished at 46-62 (.426). It’s fair for Pitino to preach patience because this will take time, but it’s also fair to start looking at his tenure through a more critical eye as we measure whether true progress is being made.